SEY HEY TEAM: Erin Pfeifer, Sarah Harvey, Xingyu Zhong, and Deanna Andru. CHOICE Humanitarian is about people. With support from our donors and partners, motivated villagers define their path out of poverty. By building skills, capacities, and leadership of the villagers, entire communities can break the cycle of poverty. Communities move forward by defining objectives and leveraging connections. SAY HEY FOR LITERACY is a team project for Choice Humanitarian, in partnership with Microsoft Edge. Choice's Accent platform is designed to promote language and literacy. As a class, we will raise $3k in 3 weeks using the Choice Humanitarian Rally Bound online crowd funding platform. The first week, the team (Xingyu joined in week 2) brainstormed ideas. Sarah came up with a positive message to women and Erin's included of sending to a friend rather that the donor. Other ideas, included a bookworm theme with crafty bookmarks for kids, or promoting literature. The first week, we came up with our ideas and decided to let the class determine the imagery, as we all had different ideas. I think this is normal, and I was happy when we agreed to use images of women in the gorgeous hand weaved textiles. Below are some image ideas, tools, and elements I played around in Photoshop. The first week, the original team members (Xingyu came later) brainstormed ides. Sarah's wanted a positive message to women and Erin's inclusion of sending to a friend rather that the donor. It was going to be an internet campaign, we talked about making buttons with the message "Say Hey" and "Make Waves"
Other ideas, was a bookworm theme or promoting literature. We loaned the button-maker from the INVST Community Studies program. Thank you Sabrina! Xingyu joined us the second week,and we decided to each create a postcard for the Donor thank-you. For the final week, we sent our designs off to the printer, then designed a card to place the buttons on with our donation site URL and other information. We also pushed our social links to friends and family. That Friday, we met to pass out the cards with buttons. I really did enjoy this project, although it was stressful as a team sometimes butting heads over ideas. We resolved conflicts by gathering your feedback and what helpful comments we received on critique, and then blending ideas. I think it was a success. 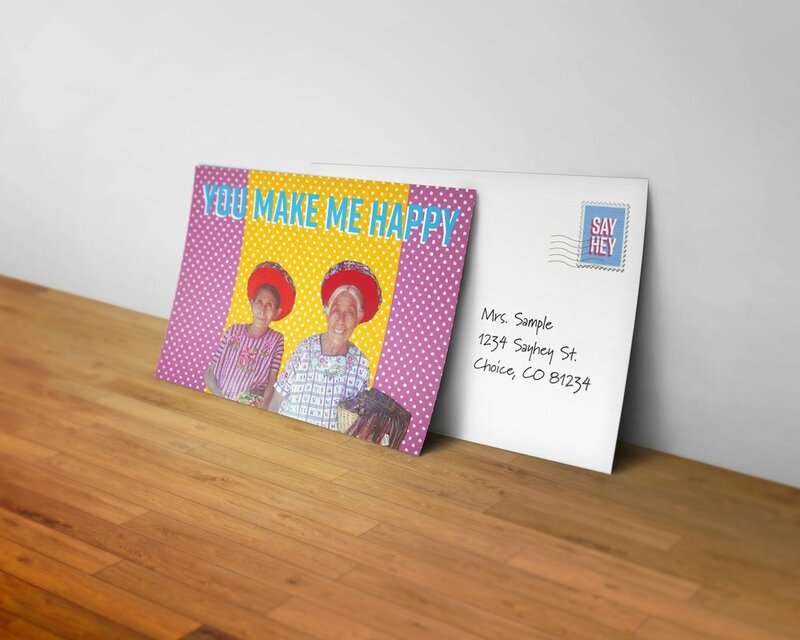 My favorite images, created by me, Include the one of Freida (directly above), the one of the beautifully clad elderly woman (directly above) with the blue polka-dot background, and the "MAKE WAVES" button, and the post card.